Amateur brewers often have to pursue their hobby under difficult conditions – they end up brewing their beer in the kitchen, the basement or the bathroom, and usually in their leisure time. But that doesn’t mean they are not successful, as the #BestBrewChallenge repeatedly shows: more often than not, home brewers walk away with the top prizes. 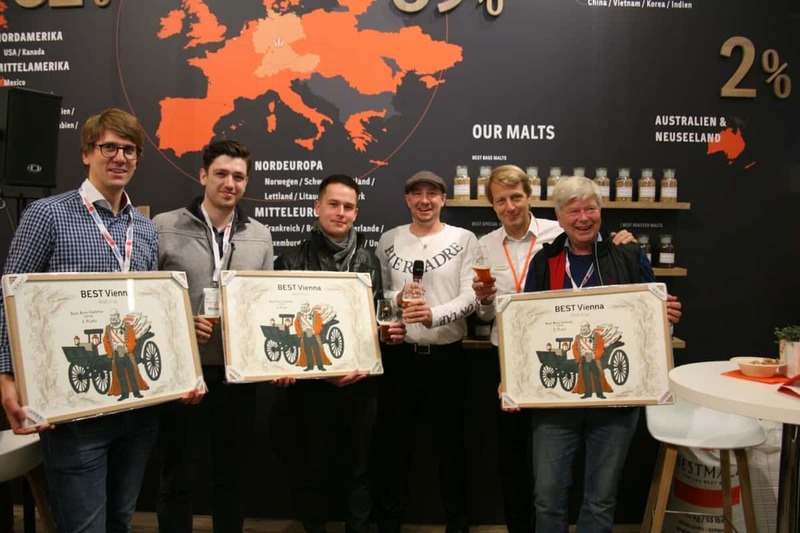 Which is what has happened again this year: The first prize went to “Vic Secret Single Hop Amber Ale” by Brauwerkstatt Eichendorff from Mannheim. The creation by Dr. Benedikt Weigand and Nicolas Loevenich was rated the best of the 75 submitted beers with 49.7 out of 50 possible points. “Himbock” by Jörn Buchbinder (Hobbybrauerei Buchbier) from Magdeburg came second and “Wiener Export” by Günther Hilger from the Seven Mountains Brewery in Königswinter took third place. This year’s BestBrewChallenge attracted 168 participants from North and Latin America, Africa, Asia and Europe, who brewed their beers simultaneously on 17 May 2018. As well as hobby brewers, they included microbreweries, large breweries and brewpubs. Every year, the organizer Palatia Malz GmbH, a malting group that sells malt and grain products under the BESTMALZ® brand, puts the focus on a different type of malt. This time round, participants had to use at least 18% BEST Vienna and ensure an original gravity of between 11 and 16° P. Other than that, they could do what they liked and were not required to comply with the German Purity Law. “Our goal is to give brewers as much creative scope as possible. Every year, we are astonished at the variety of tastes that participants from all over the world manage to entice out of one and the same malt,” says Dr. Axel Goehler, managing director of the malting group from Heidelberg and a member of the third generation of the family-owned business. Loevenich, a law student, and Weigand, a doctor, are neighbors and friends who got into brewing by chance. They produce between 20 and 25 liters per batch and concocted the winning beer after a long night shift. Runner-up Jörg Buchbinder from Magdeburg occasionally takes over the whole kitchen, or at least the kitchen table, with his home brewing kit, which makes 20 liters of beer. “Himbock is a wheat bock with a low sugar content. For my BBC brew, I experimented with raspberries (German: Himbeeren) for the first time, adding them to the beer after the main fermentation,” he says, explaining his brewing method. “The idea of getting people from around the world to start brewing simultaneously for the BestBrewChallenge is really cool.” Günther Hilger, who came third, brews on a larger scale: Seven Mountains Brewery near Bonn is run by four friends who regularly brew more than a hundred hectoliters. Seven Mountains Brewery has once again won a prize at this year’s BBC for the umpteenth time. “I’m delighted about our third place. We brewed 150 liters of our Wiener Export – that is the maximum our brewing plant can manage. It will be available to buy locally in the near future,” says Günther Hilger. The BestBrewChallenge is a collaboration brew. Brewers around the world all brew beer simultaneously – with similar grain bills in different countries and time zones. In 2018 all participants must use at least 18% of BEST Vienna, a malt with a full, golden color and excellent foaming properties. Brewers are given free hand in their choice of hops and yeast as well as the fermentation, maturation and any filtration processes they use. In addition, they do not have to comply with the German Purity Law. However, the original gravity must be between 11 and 16 °P. An international jury of beer sommeliers judged the taste. Our malts are internationally acclaimed as being among the best that breweries and brewers can wish for their beer. Over 50 different basic and special malts of the highest quality and purity. Malt tradition made in Germany. Since 1899. Roasted malt: Make sure it doesn’t burn!